Not to be confused with World Bank Group. The World Bank (French: Banque mondiale) is an international financial institution that provides loans to countries of the world for capital projects. It comprises two institutions: the International Bank for Reconstruction and Development (IBRD), and the International Development Association (IDA). The World Bank is a component of the World Bank Group. The World Bank's most recent stated goal is the reduction of poverty. As of November 2018, the largest recipients of world bank loans were India ($859 million in 2018) and China ($370 million in 2018), through loans from IBRD. The World Bank was created at the 1944 Bretton Woods Conference along with the International Monetary Fund (IMF). The president of the World Bank is, traditionally, an American. The World Bank and the IMF are both based in Washington, D.C., and work closely with each other. Although many countries were represented at the Bretton Woods Conference, the United States and United Kingdom were the most powerful in attendance and dominated the negotiations. :52–54 The intention behind the founding of the World Bank was to provide temporary loans to low-income countries which were unable to obtain loans commercially. The Bank may also make loans and demand policy reforms from recipients. When the Marshall Plan went into effect in 1947, many European countries began receiving aid from other sources. Faced with this competition, the World Bank shifted its focus to non-European countries. Until 1968, its loans were earmarked for the construction of infrastructure works, such as seaports, highway systems, and power plants, that would generate enough income to enable a borrower country to repay the loan. In 1960, the International Development Association was formed (as opposed to a UN fund named SUNFED), providing soft loans to developing countries. From 1974 to 1980 the bank concentrated on meeting the basic needs of people in the developing world. The size and number of loans to borrowers was greatly increased as loan targets expanded from infrastructure into social services and other sectors. These changes can be attributed to Robert McNamara, who was appointed to the presidency in 1968 by Lyndon B. Johnson. 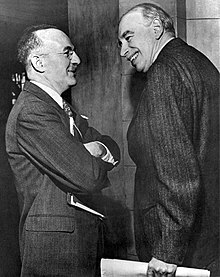 :60–63 McNamara implored bank treasurer Eugene Rotberg to seek out new sources of capital outside of the northern banks that had been the primary sources of funding. Rotberg used the global bond market to increase the capital available to the bank. One consequence of the period of poverty alleviation lending was the rapid rise of third world debt. From 1976 to 1980 developing world debt rose at an average annual rate of 20%. In 1980 the World Bank Administrative Tribunal was established to decide on disputes between the World Bank Group and its staff where allegation of non-observance of contracts of employment or terms of appointment had not been honored. In 1980 McNamara was succeeded by US President Jimmy Carter's nominee, Alden W. Clausen. Clausen replaced many members of McNamara's staff and crafted a different mission emphasis. His 1982 decision to replace the bank's Chief Economist, Hollis B. Chenery, with Anne Krueger was an example of this new focus. Krueger was known for her criticism of development funding and for describing Third World governments as "rent-seeking states". During the 1980s the bank emphasized lending to service Third-World debt, and structural adjustment policies designed to streamline the economies of developing nations. UNICEF reported in the late 1980s that the structural adjustment programs of the World Bank had been responsible for "reduced health, nutritional and educational levels for tens of millions of children in Asia, Latin America, and Africa". Beginning in 1989, in response to harsh criticism from many groups, the bank began including environmental groups and NGOs in its loans to mitigate the past effects of its development policies that had prompted the criticism. :93–97 It also formed an implementing agency, in accordance with the Montreal Protocols, to stop ozone-depletion damage to the Earth's atmosphere by phasing out the use of 95% of ozone-depleting chemicals, with a target date of 2015. Since then, in accordance with its so-called "Six Strategic Themes", the bank has put various additional policies into effect to preserve the environment while promoting development. For example, in 1991 the bank announced that to protect against deforestation, especially in the Amazon, it would not finance any commercial logging or infrastructure projects that harm the environment. In order to promote global public goods, the World Bank tries to control communicable disease such as malaria, delivering vaccines to several parts of the world and joining combat forces. In 2000 the bank announced a "war on AIDS" and in 2011 the Bank joined the Stop Tuberculosis Partnership. Traditionally, based on a tacit understanding between the United States and Europe, the president of the World Bank has always been selected from candidates nominated by the United States. In 2012, for the first time, two non-US citizens were nominated. On 23 March 2012, U.S. President Barack Obama announced that the United States would nominate Jim Yong Kim as the next president of the Bank. Jim Yong Kim was elected on 27 April 2012 and re-elected for a second five-year term in 2017. He announced that he will resign effective 1 February 2019. He was replaced on an interim basis by World Bank CEO Kristalina Georgieva. The World Bank Group headquarters building in Washington, D.C. Various developments had brought the Millennium Development Goals targets for 2015 within reach in some cases. For the goals to be realized, six criteria must be met: stronger and more inclusive growth in Africa and fragile states, more effort in health and education, integration of the development and environment agendas, more as well as better aid, movement on trade negotiations, and stronger and more focused support from multilateral institutions like the World Bank. Eradicate Extreme Poverty and Hunger: From 1990 through 2004 the proportion of people living in extreme poverty fell from almost a third to less than a fifth. Although results vary widely within regions and countries, the trend indicates that the world as a whole can meet the goal of halving the percentage of people living in poverty. Africa's poverty, however, is expected to rise, and most of the 36 countries where 90% of the world's undernourished children live are in Africa. Less than a quarter of countries are on track for achieving the goal of halving under-nutrition. Achieve Universal Primary Education: The percentage of children in school in developing countries increased from 80% in 1991 to 88% in 2005. Still, about 72 million children of primary school age, 57% of them girls, were not being educated as of 2005[update]. Promote Gender Equality: The tide is turning slowly for women in the labor market, yet far more women than men- worldwide more than 60% – are contributing but unpaid family workers. The World Bank Group Gender Action Plan was created to advance women's economic empowerment and promote shared growth. Reduce Child Mortality: There is some improvement in survival rates globally; accelerated improvements are needed most urgently in South Asia and Sub-Saharan Africa. An estimated 10 million-plus children under five died in 2005; most of their deaths were from preventable causes. Improve Maternal Health: Almost all of the half million women who die during pregnancy or childbirth every year live in Sub-Saharan Africa and Asia. There are numerous causes of maternal death that require a variety of health care interventions to be made widely accessible. Combat HIV/AIDS, Malaria, and Other Diseases: Annual numbers of new HIV infections and AIDS deaths have fallen, but the number of people living with HIV continues to grow. In the eight worst-hit southern African countries, prevalence is above 15 percent. Treatment has increased globally, but still meets only 30 percent of needs (with wide variations across countries). AIDS remains the leading cause of death in Sub-Saharan Africa (1.6 million deaths in 2007). There are 300 to 500 million cases of malaria each year, leading to more than 1 million deaths. Nearly all the cases and more than 95 percent of the deaths occur in Sub-Saharan Africa. Ensure Environmental Sustainability: Deforestation remains a critical problem, particularly in regions of biological diversity, which continues to decline. Greenhouse gas emissions are increasing faster than energy technology advancement. Develop a Global Partnership for Development: Donor countries have renewed their commitment. Donors have to fulfill their pledges to match the current rate of core program development. Emphasis is being placed on the Bank Group's collaboration with multilateral and local partners to quicken progress toward the MDGs' realization. To make sure that World Bank-financed operations do not compromise these goals but instead add to their realisation, environmental, social and legal safeguards were defined. However, these safeguards have not been implemented entirely yet. At the World Bank's annual meeting in Tokyo 2012 a review of these safeguards has been initiated, which was welcomed by several civil society organisations. The President of the Bank is the president of the entire World Bank Group. The president is responsible for chairing the meetings of the Boards of Directors and for overall management of the Bank. Traditionally, the President of the Bank has always been a US citizen nominated by the United States, the largest shareholder in the bank (the managing director of the International Monetary Fund having always been a European). The nominee is subject to confirmation by the Board of Executive Directors, to serve for a five-year, renewable term. While most World Bank presidents have had banking experience, some have not. The vice presidents of the Bank are its principal managers, in charge of regions, sectors, networks and functions. There are two Executive Vice presidents, three Senior Vice presidents, and 24 Vice presidents. The Boards of Directors consist of the World Bank Group President and 25 Executive Directors. The President is the presiding officer, and ordinarily has no vote except a deciding vote in case of an equal division. The Executive Directors as individuals cannot exercise any power nor commit or represent the Bank unless specifically authorized by the Boards to do so. With the term beginning 1 November 2010, the number of Executive Directors increased by one, to 25. Kristalina Georgieva 2019–2019 (acting) Bulgaria Former European Commissioner for the Budget and Human Resources and 2010's "European of the Year"
The International Bank for Reconstruction and Development (IBRD) has 189 member countries, while the International Development Association (IDA) has 173 members. Each member state of IBRD should also be a member of the International Monetary Fund (IMF) and only members of IBRD are allowed to join other institutions within the Bank (such as IDA). In 2010 voting powers at the World Bank were revised to increase the voice of developing countries, notably China. The countries with most voting power are now the United States (15.85%), Japan (6.84%), China (4.42%), Germany (4.00%), the United Kingdom (3.75%), France (3.75%), India (2.91%), Russia (2.77%), Saudi Arabia (2.77%) and Italy (2.64%). Under the changes, known as 'Voice Reform – Phase 2', countries other than China that saw significant gains included South Korea, Turkey, Mexico, Singapore, Greece, Brazil, India, and Spain. Most developed countries' voting power was reduced, along with a few developing countries such as Nigeria. The voting powers of the United States, Russia and Saudi Arabia were unchanged. The changes were brought about with the goal of making voting more universal in regards to standards, rule-based with objective indicators, and transparent among other things. Now, developing countries have an increased voice in the "Pool Model", backed especially by Europe. Additionally, voting power is based on economic size in addition to International Development Association contributions. The following table shows the subscriptions of the top 20 member countries of the World Bank by voting power in the following World Bank institutions as of December 2014 or March 2015: the International Bank for Reconstruction and Development (IBRD), the International Finance Corporation (IFC), the International Development Association (IDA), and the Multilateral Investment Guarantee Agency (MIGA). Member countries are allocated votes at the time of membership and subsequently for additional subscriptions to capital (one vote for each share of capital stock held by the member). For the poorest developing countries in the world, the bank's assistance plans are based on poverty reduction strategies; by combining a cross-section of local groups with an extensive analysis of the country's financial and economic situation the World Bank develops a strategy pertaining uniquely to the country in question. The government then identifies the country's priorities and targets for the reduction of poverty, and the World Bank aligns its aid efforts correspondingly. Forty-five countries pledged US$25.1 billion in "aid for the world's poorest countries", aid that goes to the World Bank International Development Association (IDA), which distributes the loans to eighty poorer countries. While wealthier nations sometimes fund their own aid projects, including those for diseases, and although IDA is the recipient of criticism, Robert B. Zoellick, the former president of the World Bank, said when the loans were announced on 15 December 2007, that IDA money "is the core funding that the poorest developing countries rely on". World Bank organizes Development Marketplace Awards, a competitive grant program that surfaces and funds innovative, development projects with high potential for development impact that are scalable and/or replicable. The grant beneficiaries are social enterprises with projects that aim to deliver a range of social and public services to the most underserved low-income groups. The World Bank has been assigned temporary management responsibility of the Clean Technology Fund (CTF), focused on making renewable energy cost-competitive with coal-fired power as quickly as possible, but this may not continue after UN's Copenhagen climate change conference in December 2009, because of the Bank's continued investment in coal-fired power plants. Together with the World Health Organization, the World Bank administers the International Health Partnership (IHP+). IHP+ is a group of partners committed to improving the health of citizens in developing countries. Partners work together to put international principles for aid effectiveness and development cooperation into practice in the health sector. IHP+ mobilizes national governments, development agencies, civil society and others to support a single, country-led national health strategy in a well-coordinated way. The World Bank doubled its aid for climate change adaptation from $2.3bn (£1.47bn) in 2011 to $4.6bn in 2012. The planet is now 0.8 °C warmer than in pre-industrial times. It says that 2 °C warming will be reached in 20 to 30 years. Global Food Security Program: Launched in April 2010, six countries alongside the Bill and Melinda Gates Foundation have pledged $925 million for food security. To date, the program has helped 8 countries, promoting agriculture, research, trade in agriculture, etc. Launched Global Food Crisis Response Program: Given grants to approximately 40 nations for seeds, etc. for improving productivity. In process of increasing its yearly spending for agriculture to $6 billion–$8 billion from earlier $4 billion. Runs several nutrition program across the world, e.g., vitamin A doses for children, school meals, etc. The World Bank Institute (WBI) was a "global connector of knowledge, learning and innovation for poverty reduction". It aims to inspire change agents and prepare them with essential tools that can help achieve development results. WBI had four major strategies to approach development problems: innovation for development, knowledge exchange, leadership and coalition building, and structured learning. World Bank Institute (WBI) was formerly known as Economic Development Institute (EDI), established on 11 March 1955 with the support of the Rockefeller and Ford Foundations. The purpose of the institute was to serve as provide an open place where senior officials from developing countries could discuss development policies and programs. Over the years, EDI grew significantly and in 2000, the Institute was renamed as the World Bank Institute. Sanjay Pradhan is the past Vice President of the World Bank Institute.As of 2019, The World Bank Institute functions have been mostly encapsulated by a new unit Global Operations Knowledge Management Unit (GOKMU) which is now responsible for knowledge management and learning across the Bank. The Global Development Learning Network (GDLN) is a partnership of over 120 learning centers (GDLN Affiliates) in nearly 80 countries around the world. GDLN Affiliates collaborate in holding events that connect people across countries and regions for learning and dialogue on development issues. GDLN clients are typically NGOs, government, private sector and development agencies who find that they work better together on subregional, regional or global development issues using the facilities and tools offered by GDLN Affiliates. Clients also benefit from the ability of Affiliates to help them choose and apply these tools effectively, and to tap development practitioners and experts worldwide. GDLN Affiliates facilitate around 1000 videoconference-based activities a year on behalf of their clients, reaching some 90,000 people worldwide. Most of these activities bring together participants in two or more countries over a series of sessions. A majority of GDLN activities are organized by small government agencies and NGOs. The GDLN in the East Asia and Pacific region has experienced rapid growth and Distance Learning Centers now operate, or are planned in 20 countries: Australia, Mongolia, Cambodia, China, Indonesia, Singapore, Philippines, Sri Lanka, Japan, Papua New Guinea, South Korea, Thailand, Laos, Timor Leste, Fiji, Afghanistan, Bangladesh, India, Nepal and New Zealand. With over 180 Distance Learning Centers, it is the largest development learning network in the Asia and Pacific region. The Secretariat Office of GDLN Asia Pacific is located in the Center of Academic Resources of Chulalongkorn University, Bangkok, Thailand. GDLN Asia Pacific was launched at the GDLN's East Asia and Pacific regional meeting held in Bangkok from 22 to 24 May 2006. Its vision is to become "the premier network exchanging ideas, experience and know-how across the Asia Pacific Region". GDLN Asia Pacific is a separate entity to The World Bank. It has endorsed its own Charter and Business Plan and, in accordance with the Charter, a GDLN Asia Pacific Governing Committee has been appointed. The committee comprises China (2), Australia (1), Thailand (1), The World Bank (1) and finally, a nominee of the Government of Japan (1). The organization is currently hosted by Chulalongkorn University in Bangkok, Thailand, founding member of the GDLN Asia Pacific. The Governing Committee has determined that the most appropriate legal status for the GDLN AP in Thailand is a "Foundation". The World Bank is currently engaging a solicitor in Thailand to process all documentation in order to obtain this legal status. GDLN Asia Pacific is built on the principle of shared resources among partners engaged in a common task, and this is visible in the organizational structures that exist, as the network evolves. Physical space for its headquarters is provided by the host of the GDLN Centre in Thailand – Chulalongkorn University; Technical expertise and some infrastructure is provided by the Tokyo Development Learning Centre (TDLC); Fiduciary services are provided by Australian National University (ANU) Until the GDLN Asia Pacific is established as a legal entity tin Thailand, ANU, has offered to assist the governing committee, by providing a means of managing the inflow and outflow of funds and of reporting on them. This admittedly results in some complexity in contracting arrangements, which need to be worked out on a case by case basis and depends to some extent on the legal requirements of the countries involved. A Justice Sector Peer-Assisted Learning (JUSTPAL) Network was launched in April 2011 by the Poverty Reduction and Economic Management (PREM) Department of the World Bank's Europe and Central Asia (ECA) Region. The JUSTPAL objective is to provide an online and offline platform for justice professionals to exchange knowledge, good practices and peer-driven improvements to justice systems and thereby support countries to improve their justice sector performance, quality of justice and service delivery to citizens and businesses. The JUSTPAL Network includes representatives of judiciaries, ministries of justice, prosecutors, anti-corruption agencies and other justice-related entities from across the globe. The Network currently has active members from more than 50 countries. To facilitate fruitful exchange of reform experiences and sharing of applicable good practices, the JUSTPAL Network has organized its activities under (currently) five Communities of Practice (COPs): (i) Budgeting for the Justice Sector; (ii) Information Systems for Justice Services; (iii) Justice Sector Physical Infrastructure; (iv) Court Management and Administration; and (v) Prosecution and Anti-Corruption Agencies. As a guideline to the World Bank's operations in any particular country, a Country Assistance Strategy is produced, in cooperation with the local government and any interested stakeholders and may rely on analytical work performed by the Bank or other parties. Clean Air Initiative (CAI) is a World Bank initiative to advance innovative ways to improve air quality in cities through partnerships in selected regions of the world by sharing knowledge and experiences. It includes electric vehicles. Initiatives like this help address and tackle pollution-related diseases. Based on an agreement between the United Nations and the World Bank in 1981, Development Business became the official source for World Bank Procurement Notices, Contract Awards, and Project Approvals. In 1998, the agreement was re-negotiated, and included in this agreement was a joint venture to create an electronic version of the publication via the World Wide Web. Today, Development Business is the primary publication for all major multilateral development banks, United Nations agencies, and several national governments, many of whom have made the publication of their tenders and contracts in Development Business a mandatory requirement. The World Bank or the World Bank Group is also a sitting observer in the United Nations Development Group. The World Bank collects and processes large amounts of data and generates them on the basis of economic models. These data and models have gradually been made available to the public in a way that encourages reuse, whereas the recent publications describing them are available as open access under a Creative Commons Attribution License, for which the bank received the SPARC Innovator 2012 award. The World Bank also endorses the Principles for Digital Development. The following table lists the top 15 DAC 5 Digit Sectors to which the World Bank has committed funding, as recorded by it in its International Aid Transparency Initiative (IATI) publications. The World Bank states on the IATI Registry website that the amounts "will cover 100% of IBRD and IDA development flows" but will not cover other development flows. The World Bank hosts the Open Knowledge Repository (OKR) as an official open access repository for its research outputs and knowledge products. The World Bank's repository is listed in the Registry of Research Data Repositories re3data.org. The World Bank has long been criticized by non-governmental organizations, such as the indigenous rights group Survival International, and academics, including its former Chief Economist Joseph Stiglitz, Henry Hazlitt and Ludwig Von Mises. Henry Hazlitt argued that the World Bank along with the monetary system it was designed within would promote world inflation and "a world in which international trade is State-dominated" when they were being advocated. Stiglitz argued that the so-called free market reform policies that the Bank advocates are often harmful to economic development if implemented badly, too quickly ("shock therapy"), in the wrong sequence or in weak, uncompetitive economies. Similarly, Carmine Guerriero notices that these reforms have introduced in developing countries regulatory institutions typical of the common law legal tradition because allegedly more efficient according to the legal origins theory. The latter however has been fiercely criticized since it does not take into account that the legal institutions transplanted during the European colonization have been then reformed. This issue makes the legal origins theory's inference unreliable and the World Bank reforms detrimental. The United States Senate Committee on Foreign Relations report criticized the World Bank and other international financial institutions for focusing too much "on issuing loans rather than on achieving concrete development results within a finite period of time" and called on the institution to "strengthen anti-corruption efforts". James Ferguson has argued that the main effect of many development projects carried out by the World Bank and similar organizations is not the alleviation of poverty. Instead the projects often serve to expand the exercise of bureaucratic state power. Through his case-studies of development projects in Thaba-Tseka he shows that the World Bank's characterization of the economic conditions in Lesotho was flawed, and the Bank ignored the political and cultural character of the state in crafting their projects. As a result, the projects failed to help the poor, but succeeded in expanding the government bureaucracy. Criticism of the World Bank and other organizations often takes the form of protesting, such as the World Bank Oslo 2002 Protests, the 2007 October Rebellion, and the 1999 Battle of Seattle. Such demonstrations have occurred all over the world, even among the Brazilian Kayapo people. Another source of criticism has been the tradition of having an American head the bank, implemented because the United States provides the majority of World Bank funding. "When economists from the World Bank visit poor countries to dispense cash and advice", observed The Economist in 2012, "they routinely tell governments to reject cronyism and fill each important job with the best candidate available. It is good advice. The World Bank should take it." Jim Yong Kim, a Korean-American, is the most recently appointed president of the World Bank. Some critics, most prominently the author Naomi Klein, are of the opinion that the World Bank Group's loans and aid have unfair conditions attached to them that reflect the interests, financial power and political doctrines (notably the Washington Consensus) of the Bank and, by extension, the countries that are most influential within it. Among other allegations, Klein says the Group's credibility was damaged "when it forced school fees on students in Ghana in exchange for a loan; when it demanded that Tanzania privatise its water system; when it made telecom privatisation a condition of aid for Hurricane Mitch; when it demanded labour 'flexibility' in Sri Lanka in the aftermath of the Asian tsunami; when it pushed for eliminating food subsidies in post-invasion Iraq". The World Bank requires sovereign immunity from countries it deals with. Sovereign immunity waives a holder from all legal liability for their actions. It is proposed that this immunity from responsibility is a "shield which The World Bank wants to resort to, for escaping accountability and security by the people". As the United States has veto power, it can prevent the World Bank from taking action against its interests. ^ a b c /en/about/leadership/members "Boards of Executive Directors – Member Countries"]. Retrieved on 5 June 2016. ^ "David Malpass, a US Treasury official and Donald Trump's pick, appointed World Bank president". scroll.in. Retrieved 6 April 2019. ^ "World Bank Group Leadership". World Bank. Retrieved 2 August 2018. ^ "Banque mondiale". Retrieved 25 October 2017. ^ "About Us". World Bank. 14 October 2008. Retrieved 9 November 2008. ^ a b c Clemens, Michael A.; Kremer, Michael (2016). "The New Role for the World Bank". Journal of Economic Perspectives. 30 (1): 53–76. doi:10.1257/jep.30.1.53. ISSN 0895-3309. ^ "Country snapshot". World bank country snapshot website. World Bank / IBRD. Retrieved 5 November 2018. ^ "List of official reports - World bank projects in China". www.projects.worldbank.org. World bank. Retrieved 5 November 2018. ^ "The Founding Fathers". Internashittional Monetary Fund. Retrieved 11 August 2012. ^ The New York Times, 17 March 2015, "France, Germany and Italy Say They'll Join China-Led Bank"
^ a b c d Goldman, Michael (2005). Imperial Nature: The World Bank and Struggles for Social Justice in the Age of Globalization. New Haven, CT: Yale University Press. ISBN 978-0-300-11974-9. ^ Bird, Kai (1992). The Chairman: John J. McCloy, the Making of the American Establishment. New York, NY: Simon & Schumpeter. ISBN 978-0-671-45415-9. ^ World Bank. "World Bank Historical Chronology: 1970–1979". World Bank Group. Retrieved 31 May 2012. ^ Rotberg, Eugene (1994). "Financial Operations of the World Bank". Bretton Woods: looking to the future: commission report, staff review, background papers. Washington, D.C.: Bretton Woods Commission. Archived from the original on 5 July 2016. Retrieved 13 August 2012. ^ Mosley, Paul; Harrigan, Jane; Toye, John (1995). Aid and Power: The World Bank and Policy Based Lending, 2nd Edition. 1. Abington, UK: Routledge. ISBN 978-0-415-13209-1. ^ Toussaint, Eric (1999). Your Money or Your Life! : The Tyranny of Global Finance. London, UK: Pluto Press. ISBN 978-0-7453-1412-9. ^ World Bank. 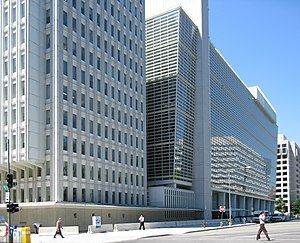 "World Bank Administrative Tribunal". World Bank Group. Archived from the original on 29 December 2011. Retrieved 14 August 2011. ^ NELSON D. SCHWARTZ (25 January 2013). "A.W. Clausen, Former Bank of America Chief, Dies at 89". The New York Times. Retrieved 27 October 2016. Mr. Clausen was chosen by President Jimmy Carter to lead the World Bank shortly before Mr. Carter was defeated by Ronald Reagan in 1980, but the new administration supported Mr. Clausen's nomination. ^ "Tom Clausen, BofA, World Bank head, dies". SFGate. 23 January 2013. Retrieved 27 October 2016. That focus paid dividends when President Jimmy Carter nominated him in 1980 to succeed Robert McNamara as president of the World Bank. ^ Cornia, Giovanni Andrea; Jolly, Richard; Stewart, Frances, eds. (1987). Adjustment with a Human Face: Protecting the Vulnerable and Promoting Growth. New York, NY: Oxford University Press USA. ISBN 978-0-19-828609-7. ^ World Bank. "Results". World Bank Group. Retrieved 31 May 2012. ^ Office of the Press Secretary (23 March 2012). "President Obama Announces U.S. Nomination of Dr. Jim Yong Kim to Lead World Bank". The White House. Retrieved 23 March 2012. ^ BBC. "Jim Yong Kim steps down as President of World Bank". bbc.com. ^ World Bank. "Millennium Development Goals". World Bank Group. Retrieved 31 May 2012. ^ Korinna Horta (February 2013). "Most relevant review". dandc.eu. ^ Hurlburt, Heather (23 March 2012). "Why Jim Yong Kim would make a great World Bank president". The Guardian. Retrieved 23 March 2012. ^ World Bank. "Leadership". World Bank Group. Retrieved 17 July 2012. ^ World Bank. "Senior Management". World Bank Group. Retrieved 12 August 2012. ^ World Bank. "Boards of Directors". World Bank Group. Retrieved 12 August 2012. ^ Heather Hurlburt (23 March 2012). "Why Jim Yong Kim would make a great World Bank president". The Guardian. London. Retrieved 9 March 2016. Kim is a naturalized US citizen who was born in Korea. ^ "Developing nations get more say in World Bank affairs". The Times of India. 26 April 2010. Retrieved 5 April 2014. ^ International Bank for Reconstruction and Development (2010). IBRD 2010 Voting Power Realignment (PDF) (Report). World Bank Group. Retrieved 14 August 2011. ^ Veloo, Betsy May (26 April 2010). "China given more influence in World Bank". RTHK. Retrieved 26 April 2010. ^ Stumm, Mario (March 2011). "World Bank: More responsibility for developing countries". D+C. Retrieved 12 August 2011. ^ Landler, Mark (15 December 2007). "Britain Overtakes U.S. as Top World Bank Donor". The New York Times. Retrieved 14 August 2011. ^ Wheeler, David (20 May 2008). "Climate Change in Nashville: A Gathering Storm for the World Bank?". Center for Global Development. Retrieved 9 November 2008. ^ "New Report Examines Risks of 4 Degree Hotter World by End of Century". worldbank.org. World Bank. 18 November 2012. Retrieved 12 October 2013. ^ World Bank Institute. "About WBI". World Bank Group. Archived from the original on 29 May 2012. Retrieved 31 May 2012. ^ Clean Air Initiative. "About Us". Clean Air Initiative-Asia Center. Archived from the original on 25 June 2010. Retrieved 31 May 2010. ^ a b Development Business. "About Us". United Nations. Retrieved 19 August 2012. ^ United Nations Development Group. "UNDG Members". United Nations. Archived from the original on 11 May 2011. Retrieved 19 August 2012. ^ Strom, Stephanie (2 July 2011). "World Bank Is Opening Its Treasure Chest of Data". The New York Times. Retrieved 20 August 2012. ^ SPARC. "SPARC Innovator: The World Bank". Association of Research Libraries. Retrieved 12 July 2012. ^ Vasdev, Samhir (18 April 2016). "Why the World Bank endorses the Principles for Digital Development". Information and Communications for Development. ^ "DAC 5 Digit Sector". The IATI Standard. Retrieved 4 September 2016. ^ "About - The World Bank - IATI Registry". Retrieved 4 September 2016. ^ "Open Knowledge Repository (OKR)". World Bank. Retrieved 22 October 2013. ^ "World Bank Entry in re3data.org". www.re3data.org. Retrieved 21 July 2014. ^ Stiglitz, Joseph E. (2003). The Roaring Nineties: A New History of the World's Most Prosperous Decade. New York, NY: W. W. Norton & Company. ISBN 978-0-393-05852-9. ^ a b Stiglitz, Joseph E. (2003). Globalization and Its Discontents. New York, NY: W. W. Norton & Company. ISBN 978-0-393-32439-6. ^ a b Stiglitz, Joseph E. (2007). Making Globalization Work. New York, NY: W. W. Norton & Company. ISBN 978-0-393-33028-1. ^ Hazlitt, Henry (1984). From Bretton Woods to World Inflation: A Study of the Causes and Consequences. Washington, D.C.: Regnery Publishing. ISBN 978-0-89526-617-0. ^ Schneider, Jane (2002). "World Markets: Anthropological Perspectives". In MacClancy, Jeremy (ed.). Exotic No More: Anthropology on the Front Lines. Chicago, IL: University of Chicago Press. ISBN 978-0-226-50013-3. ^ Carmine Guerriero (2016). "Endogenous Legal Traditions". International Review of Law and Economics. 46: 49–69. doi:10.1016/j.irle.2016.02.001. ^ Carmine Guerriero (2016). "Endogenous Legal Traditions and Economic Outcomes". Journal of Comparative Economics. 44: 416–433. doi:10.1016/j.jce.2015.12.008. ^ Woods, Ngaire (2007). The Globalizers: The IMF, the World Bank, and Their Borrowers. Ithaca, NY: Cornell University Press. ISBN 978-0-8014-7420-0. ^ Alexander, Titus (1996). Unravelling Global Apartheid: An Overview of World Politics. Cambridge, UK: Polity. ISBN 978-0-7456-1352-9. ^ Ferguson, James; Lohmann, Larry (September – October 1994). "The Anti-Politics Machine" (PDF). The Ecologist. 24 (5): 176–181. ^ Gibbs, Walter (25 June 2002). "Europe: Norway: Protests As World Bank Meets". The New York Times. Retrieved 20 August 2012. ^ Williams, Clarence; Ruane, Michael E. (20 October 2007). "Violence Erupts at Protest in Georgetown". The Washington Post. Retrieved 30 May 2008. ^ Wilson, Kimberly A.C. (7 December 1999). "Embattled police chief resigns". Seattle Post-Intelligencer. Retrieved 19 May 2008. ^ Clendenning, Alan (21 May 2008). "Amazon Indians Attack Official Over Dam Project". National Geographic. Associated Press. Retrieved 21 May 2008. ^ "Hats off to Ngozi". The Economist. 31 March 2012. Retrieved 2 April 2012. ^ Rushe, Dominic; Stewart, Heather; Mark, Monica (16 April 2012). "World Bank names US-nominated Jim Yong Kim as president". The Guardian. Retrieved 17 April 2012. ^ Graeber, David. Direct Action: An Ethnography. AK Press. pp. 442–443. ISBN 978-1-904859-79-6. ^ a b c deVries, Barend A. (1996). "The World Bank's Focus on Poverty". In Griesgraber, Jo Marie; Gunter, Bernhard G. (eds.). The World Bank: Lending on a Global Scale. London, UK: Pluto Press. ISBN 978-0-7453-1049-7. ^ a b Tan, Celine (2007). "The poverty of amnesia: PRSPs in the legacy of structural adjustment". In Stone, Diane; Wright, Christopher (eds.). The World Bank and Governance: A Decade of Reform and Reaction. New York, NY: Routledge. ISBN 978-0-415-41282-7. ^ Hardstaff, Peter (2003). "Treacherous conditions: How IMF and World Bank policies tied to debt relief are undermining development" (PDF). World Development Movement. Retrieved 12 May 2013. ^ Klein, Naomi (27 April 2007). "The World Bank has the perfect standard bearer". The Guardian. Retrieved 12 May 2013. ^ a b c IFI Watch (2004). "The World Bank and the Question of Immunity" (PDF). IFI Watch – Bangladesh. 1 (1): 1–10. Retrieved 4 September 2004. ^ World Bank (2007). Sovereign Immunity (PDF) (Report). World Bank Group. Retrieved 20 August 2012. ^ Hasson, Adam Isaac (2002). "Extraterritorial Jurisdiction and Sovereign Immunity on Trial: Noriega, Pinochet, and Milosevic – Trends in Political Accountability and Transnational Criminal Law". Boston College International and Comparative Law Review. 25 (1): 125–158. Retrieved 25 April 2012. ^ "WB channels Delhi water for PWC". This page is based on the Wikipedia article World Bank; it is used under the Creative Commons Attribution-ShareAlike 3.0 Unported License (CC-BY-SA). You may redistribute it, verbatim or modified, providing that you comply with the terms of the CC-BY-SA.